Candyman is a character based around his powerful super and mixup capabilities. He has great tools to use in the early burst as well as a great additional movement option through walls. He's, in my opinion, one of the most difficult characters to learn due to his need to gain and use his super effectively and quickly. Not only that, but because he's so dependent on his super, he needs to know how to be able to juggle if he thinks it's necessary to get multiple hits on his ball. Learning these mechanics and their utility can be difficult, but with enough practice, you too will be able to play the Jawbreaking madman. It's important that you learn the angles of all characters to understand the matchup and counter another person's playstyle, but Candyman's comparably can seem really daunting. There is a helpful album compiled showing everyone's angles and I highly suggest you view it after this section. There will be a link. Special Attribute (Movement through walls): While Candyman is running towards a wall, if he inputs a crouch when he makes contact with it, he will pass through to the other side of the map, this can be helpful or harmful. Use with caution. Bunt: Although not a tool to be throwing around crazily, it's good in early burst because of its far reach forward which can intercept some hits if he can get in. Neutral Hit: A simple forward hit that sends the ball straight. Neutral Hit angled up: A situational angle for some good mix-up potential at late burst and with special. Neutral Hit angled down (grounded): A good angle to use to catch people that think you'll be attemping a mix-up with your upward angle or trying to up angle loop. Neutral Hit angled down (airborne): A way to give the ball back to yourself on most maps when you use special. 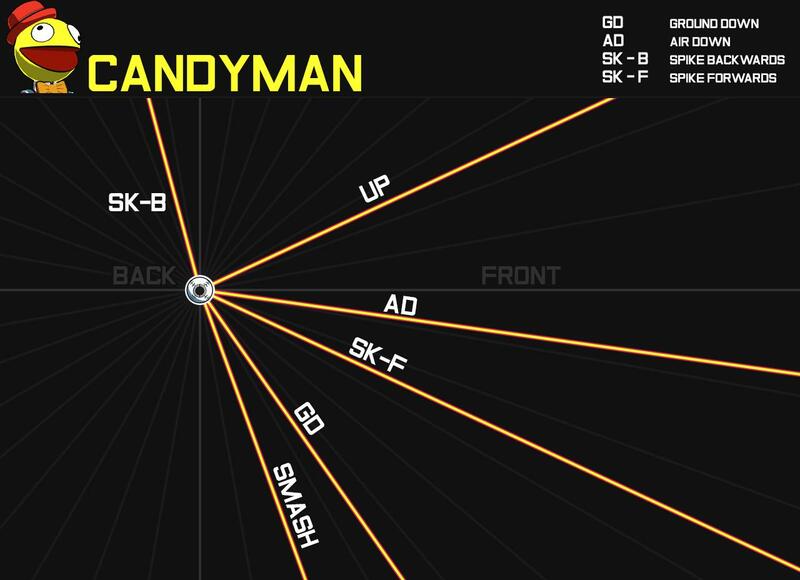 Smash: A great overall tool for Candyman in the early burst. Bad and predictable angle late burst, but good for panic situations and special move set-ups. Can be used twice out of a full jump or serve for two energy. Spike: A simple downwards hit. Spike (forward): A hit angled forward at a steep angle, almost similar to Switch's special's angle. Spike (back): An upward hit that makes a game of keepaway possible with people that don't like to commit to jumps or want to punish your landing. Overall, his moves are very simple and have uses that mainly are enhanced by his super. 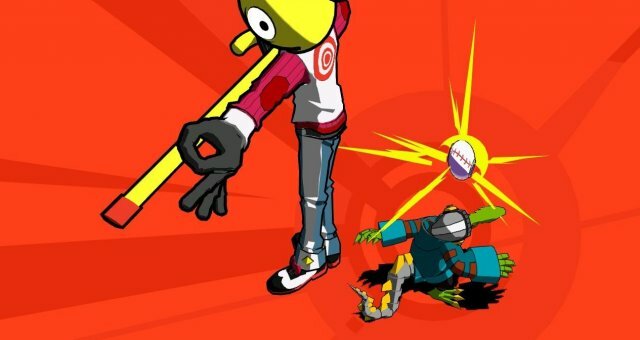 Neutral Hit (Special): A good way to reset the ball for yourself if you are in a bad position or have no jumps remaining. Neutral Hit angled up (special): A great tool that can loop on all maps and be used to confuse the opponent greatly. Neutral Hit angled down (special, grounded): Usually used to catch opponents not paying attention during special, but can be followed up with using smash. Neutral Hit angled down (special, airborne): A great way to follow up a special which can sometimes catch eager opponents or be used to mix-up after you land. Smash (special): Still a good tool, as the angle will not change as long as you keep the stick in a neutral position. Usually used to confuse opponents, since the angle can be changed on a Smash (special), but not on a regular Smash. Spike (special): Can be used in some situations to catch opponents that are afraid of up angled balls. Spike (special, back): An incredibly interesting tool that can be looped and used to continue harassment and pressure with his special. This is a section that I don't think needs to be made, but I should to create some thoughts and provoke some inspiration. In my opinion, Candyman needs to get super early burst to make his late burst really powerful. With the options and angles available out of a neutral hit in the air, the only thing that makes him scary is the fact that his ability to use his special is the thing that the opponent will have to react to. This leads to Candyman having a good punish game and taking a stock off of the opponent. It's not worth the time early burst to not hit the ball and lose out on all that opportunity, especially in scenarios where you accidently (or not) smash the ball in late burst and get punished for using a predictable angle with 3 meter and no possibility for a mix-up. That being said, Candyman is, in my opinion, not a good character unless he can infiltrate and recieve the ball from the player that is in control of it. So you've learned what moves Candyman has, and you know when to use his special, but you just aren't certain on how you should follow up. Hell, even how to predict where the ball is going to be. First, realize that if you're doing a smash, you can change the angle of the ball. This makes Candyman's smash an incredible late burst option. If you are smashing and you want to have a ball go straight, then you have to hold forward. Second, imagine every stage is a grid. This will make follow-ups slightly easier if you don't have the time or aren't in the correct situation to use an up angle loop. Third, what the heck is an up angle loop? I'm glad I asked. An up angle loop is a way that Candyman can use specific attributes of a stage to continuously hit his special and make pressure a breeze. There are four different classifications of stages I created. Loop, Alternate, JumpHit, and Police. Loop is comprised of Candyman's cell, the Subway Train, Paradise Field, and the Pool. 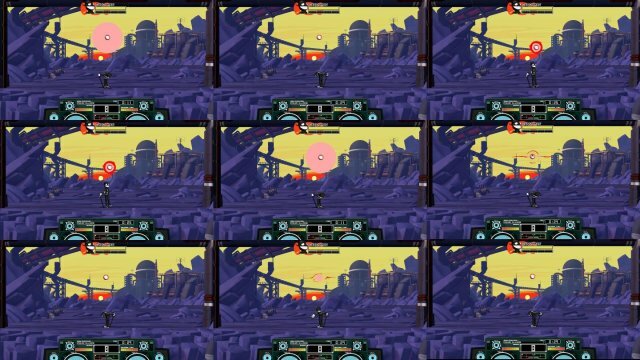 These are stages that when you use up angled hits on, they will return to their original position. This means that Candyman can set himself up to hit his ball again by being in the same place as he was. Alternate is comprised of the rocky arena from the first game (don't know what the name is), and the Sewers. These are stages where you will have to switch between facing left and right to get the loop. JumpHit is comprised of the Elevator and the Switchbot Factory. These are arenas where you have to jump to get the second hit and can either continue to use your double jump or angle down to reset the ball. Police is the police car level, and it is its own category. To do a loop on this map, you must jump twice then angle down to get the loop proper. This means that if you can strike this stage, you should. In some scenarios, I've been able to just JumpHit, but it may take some more specific timing and positioning. It also may not loop properly if you decide to only JumpHit, but sometimes you gotta do what you gotta do. I practice these loops all the time in training mode, they are nifty ways to remember how to follow up on your up angle attacks and will become muscle memory over time. This will make it easier to react and create more interesting patterns with your Jawbreaker.